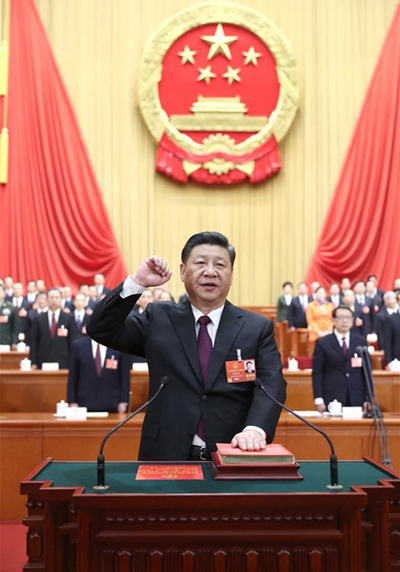 "I pledge my allegiance to the Constitution of the People's Republic of China (PRC) to safeguard the Constitution authority, fulfil my legal obligations ..." Newly elected Chinese President Xi Jinping took the solemn oath in Beijing on March 17. Xi was elected Chinese president and chairman of the Central Military Commission of the PRC on March 17 at the ongoing first session of the 13th National People's Congress, the national legislature. The amendment also wrote Xi Jinping Thought on Socialism with Chinese Characteristics for a New Era as a guiding theory for China, the most populous country in the world.